I received an e-mail from a good friend in the states a few weeks back and he told me it looks like I’m doing more partying than working. It was then I realized that a lot of the things I’m publicizing are the fun activities I’m doing aside from what I do during business hours. The Facebook photos don’t help, either. Chad, buddy, this blog is because of you. I’ve grown tired of spending time at the office. It’s air conditioned and there is now reliable internet. Once I get there, it can be hard to leave. My friend Joe called me and told me he spends a day or two a week at the local health station, or anami. I hadn’t thought of this idea – other than to stop by and introduce myself – so I went back and asked if I could spend a day there observing and they liked the idea. I’ve only spent four days at the anami, but it’s been a great change of pace and I’m meeting new people in the community. 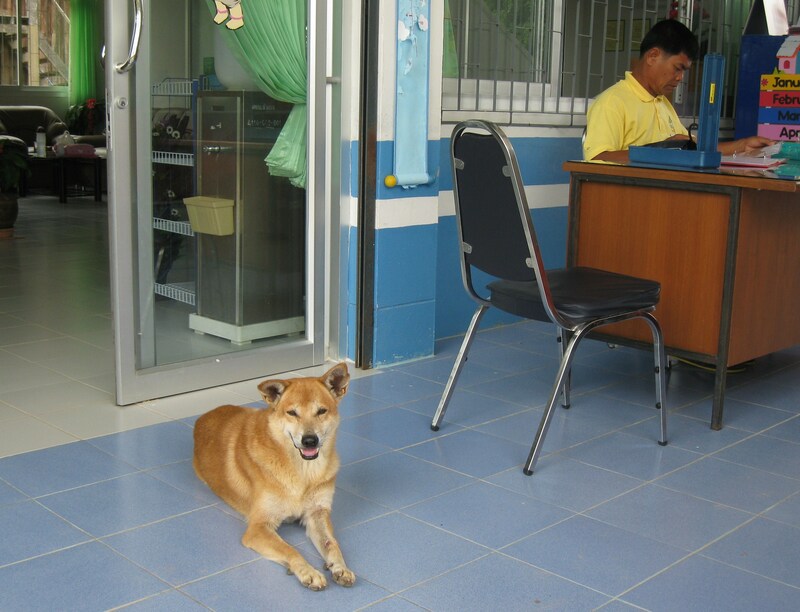 The anami is basically a small clinic with the occasional dog wandering inside. 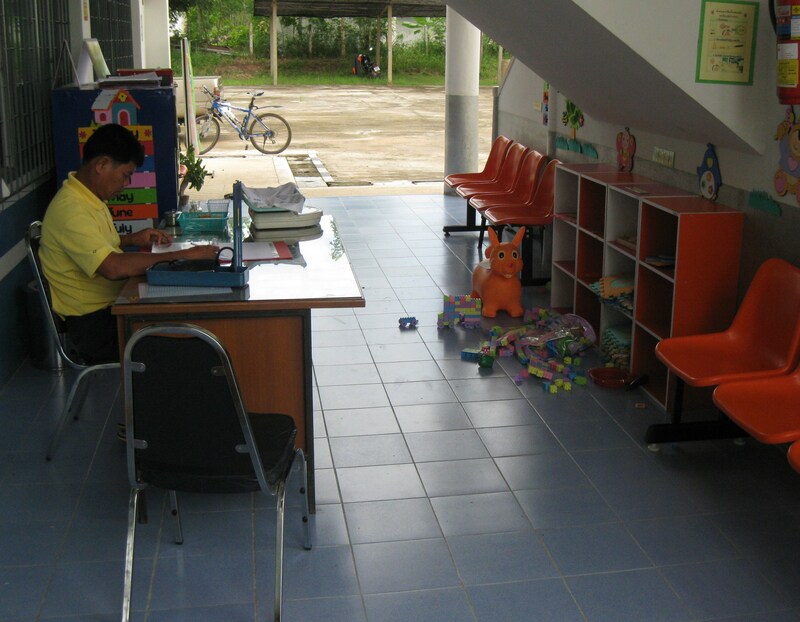 For Thailand, it is remarkably clean and sterile. There is one doctor on duty and two or three nurses at a time. They told me to come on Mondays because that’s when they have the most patients. There’s a waiting area outside (covered from the rain) where the patients fill out some paperwork, show their medical I.D. card (Thailand has universal health coverage) and have their blood pressure taken by a nurse while describing their symptoms. The most frequent visitor. He's there every week. There is one nurse inside at a desk taking one patient at a time. With my limited language skills, I could make out a few of the things she was saying like “How are you?” and “How many days have you felt this?” The nurse is a pretty 28-year old woman with braces and about eight months pregnant. Nurse Khun Nong looks over a patient. One patient came in with some sort of muscle strain in her legs. The nurse brought me to a room where they were giving the woman a massage. It was a bit awkward sitting there and watching, but educational. Privacy is not the same in Thailand as it is in the states. The examination is done at a desk in an open room within earshot of other patients. I, however, have not hear the nurse say, “Your what hurts?” yet. A massage to relieve a muscle strain. It was at the anami that I realized I did not inherent my mother’s (a nurse) strong stomach at the sight of blood. A man had some sort of cut on his ankle and needed the bandage changed. I glanced in the room to see a blood-caked gauze pad and felt myself get light-headed. A nurse I will never be. Lunch. They even order a som tam salad without peppers for me. Although my stomach seems to be getting stronger with my last visit when I went on a house call with a nurse who needed to remove 40 stitches from the ankle of a motorcycle accident victim. On the ride to his place, I became worried when I learned he wasn’t wearing a helmet which made me think of Dana Carvey playing Massive Headwound Harry on Saturday Night Live. As she began to remove the stitches I made myself watch. I felt like I was about to watch the scene in The Shining with the dead twin little girls in the hallway. Don’t be such a wuss, Jeff, watch it! I did and it wasn’t nearly as scary as two dead girls asking to play with them in an empty hotel in Northern Colorado. The waiting area which tends to look this empty after 10:30 a.m. or so. I’ve told the anami workers I’d like to help in some way. Last Monday I was doing something that requires thousands of dollars in education in the states – moving pills from one container to another. Yes, for a little while, I was a pharmacist. 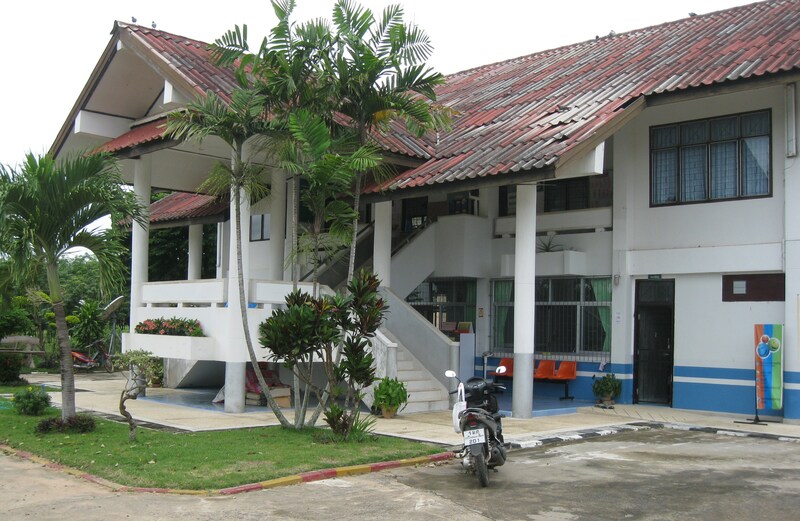 This entry was posted in Peace Corps and tagged health, peace corps, thailand, the shining by Jeff Jackson. Bookmark the permalink. That’s what I’m talkin’ about! Well done.